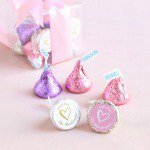 Are you considering do it yourself bridal shower favors? You may be a crafty person who enjoys adding your personal touch. You may be trying to save some money on this area of party expenses. Whatever the reason, homemade bridal shower favors are easy with the right supplies. • Any tips before I begin? • Make a sample to be sure you're happy with the idea you've chosen. some extra guests. You don't want to have less than you need. • Make them well in advance, especially if you have a large guest list. • Ask for help if you need it. Have a "craft night" for anyone helping. This is a fun way to get the favors done quickly. These DIY ideas will often start with some type of container. You'll have many options from which to choose. 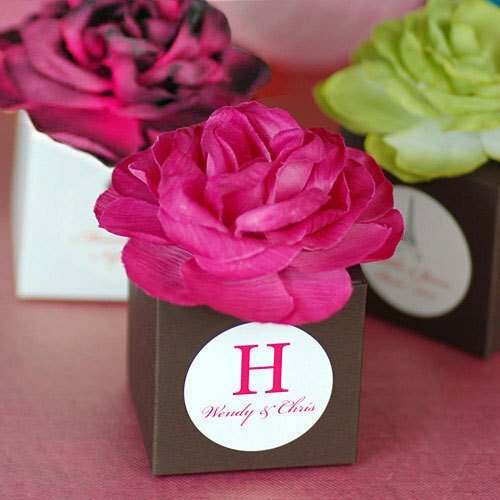 • Use packaging for your do it yourself bridal shower favors that coordinate with your theme. • Organza: these sheer material favor bags, come in several sizes, and a variety of colors. They have a drawstring ribbon for closing after you have filled them. • Frosted film bags: these luminescent holders come with a soft rounded handle. They vary in size from 4"x3"x6", up to 16"x6"x12", and an assortment of colors. • Paper bags: these come in a variety of sizes and colors, and have a twisted paper handle. • Plastic gift bags: these are clear plastic bags. You may also choose one with a design. Fill bag, add a twist tie or ribbon, and you're finished. • Candy wrappers: you can create your own personalized candy bars. Beaucoup will let you order the complete personalized chocolate Hershey bar with a design and saying of your choice. 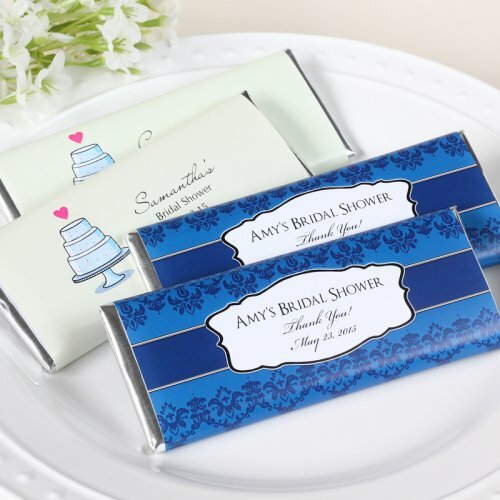 You can also order the labels only, to seal around the candy bar of your choice, creating unique do it yourself bridal shower favors. 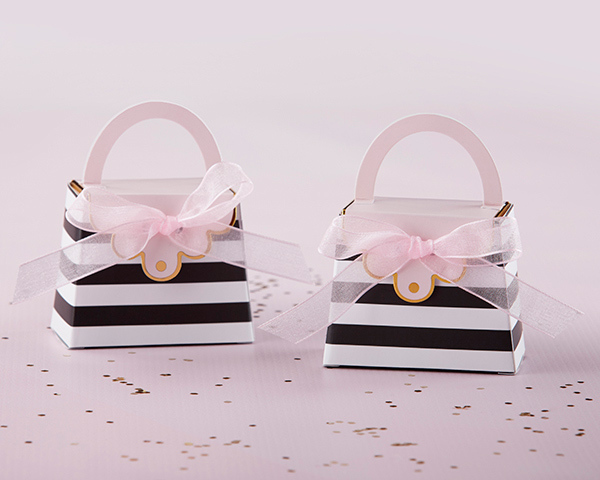 Favor boxes are an alternative to bags. These containers come in various sizes. • Cardboard: these come in solid and print designs. Shapes vary, and some have handles. They can be imprinted with the saying and design of your choice. • Acrylic: round, square, and heart are just some of the shapes for this style box. Just fill with candy, and add a personalized ribbon! • Small jars: these also come in all different shapes and sizes. Think baby food jars, perfume vials, small jelly jars, spice containers, or other holder with visual appeal. • Tin containers are available in different shapes, including round, heart, and rectangle. Just fill, and add bow and tag. You've chosen your container, now you need to fill it. Any small candies will be appropriate. Jelly beans, almonds, hard candy and mints, are just some of the choices available. • Personalized satin ribbons will add the final touch. Add the name of the bride, or couple, and date of the shower. • Bridal shower favor tags help make your favors unique. The shape can be rectangular, square, heart, round or whatever you think fits your theme. Adding the name and date, transforms an ordinary item into a special keepsake.